Beyond any considerations of cost and efficiency, light fixtures powered by PoE can be paired with sensors, wireless communication modules, and embedded processors in smart hubs. For electrical contractors, this technology offers a wealth of opportunities to streamline building automation, enhance building efficiency and provide value-added expertise and services. PoE technologies and PoE devices are delivering cost savings, easy installation and enhanced flexibility to projects of all sizes. PoE refers to the use of the same wires that are part of a structured IT network for the delivery of electrical power. 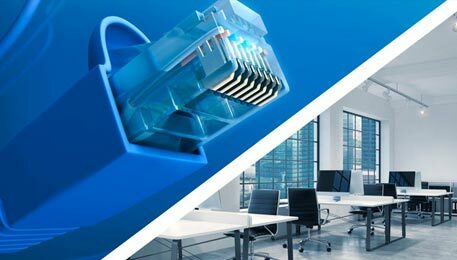 This enables a single cable to provide both a data connection and electrical power to PoE devices, such as wireless access points and lighting, PoE adapters, PoE switches and PoE ports, phone systems, PoE cameras and LED lighting. Connecting smart LED lighting/sensor hubs to the LAN delivers valuable future-proofing by enabling the installed LED hubs to quickly support and take advantage of technologies like the Internet of Things (IoT) without additional, expensive lighting replacement.